About a year ago, I was fed up with my IT consultant. He was charging me $125/hour, and he spent 30 minutes checking his own personal email while he ran system checks on my Mac computers. I couldn’t believe it! With four macs, four iPhones, and two iPads, there were plenty of other issues that I needed help with. So, I went to Google in search of a new IT consultant. With a single search on “Mac support, Silver Spring, MD,” I landed on Jimmymacsupport.com. I checked out his website, and he looked the part, and someone that seemed OK to invite into the office once in a while. I checked out his blog, and it was full of tips I found incredibly helpful. He had a full client list, and plenty of testimonials. And his site was high-tech, in a helpful way (it was easy to book an appointment). His website seemed credible in every way, from the simple, professional design, to the helpful content, and I felt reassured by the presentation. He did a great job of sharing information that his target market (me) finds valuable—and while I was reading his tips, I was also drawn to learn more about his services. Write blog posts that are incredibly helpful to your prospects. One of the best places to start is by answering your FAQs in separate blog posts. One question I get a lot is “how can I drive more customers to my site” : ). Don’t worry about giving away your secret sauce! Share your expertise via tips, tricks, and customer success stories. This will establish your expertise in how you deliver services. Consider giving away the “what” and the “why,” but not all of the “how” of your services. “What” is needed, “why” it’s a benefit, but not exactly how your customer would do it. Help your ideal client find your website when he conducts a Google search – just use the same keywords he/she does in your website content. I always ask my customers how they found me, and what they searched on. “Blog” posts are indexed by Google differently than regular “page” content, making it easier you easier to find when your client is trying to find you. When in doubt, add a blog post rather than new content to existing web pages. It really works: One blog post I wrote in 2012 was responsible for over ten very good inquiries, and several very large, recurring projects! As I mentioned above, blogging about FAQs is a smart way to help people find your website – and stay on it. You might also consider answering the questions that you wish your prospects would ask. 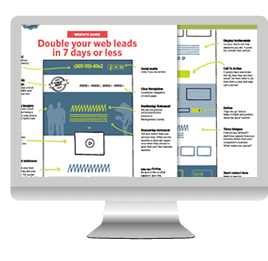 Offering free reports can attract the right clients to your website. For instance, AQUENT, a company that provides talent like graphic designers and copywriters, publishes salary ranges for creatives every year. When I need a graphic designer, I turn to them first. Jimmy is still helping us with all of our IT needs, and I’m so glad that I found him last year. Try some or all of the above tips – and let me know if your website traffic increases and if it lands you new clients!